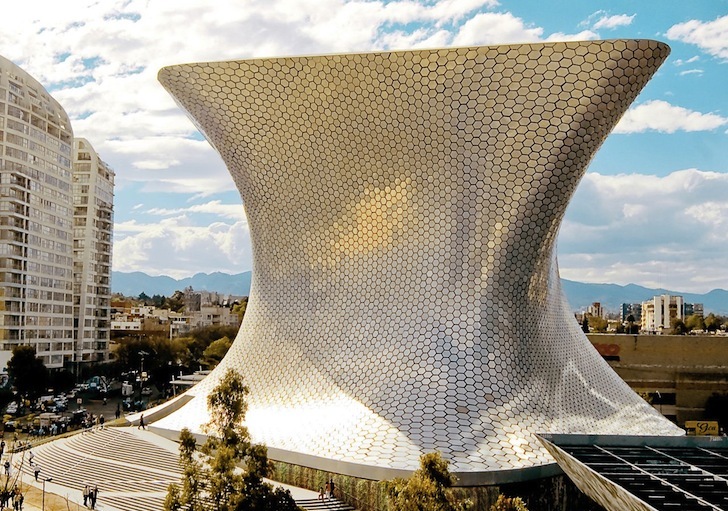 Rising from the ground like a silvery cloud, the glittering Museo Soumaya has cemented itself as one of Mexico City’s few iconic architectural landmarks. Commissioned by business magnate and multibillionaire Carlos Slim Helú, the expansive art museum was created to house his private collection, thus presenting the city with one of the most important art collections in Latin America. The "impossible to build" facade, covered by silver honeycomb tiles, was designed by Fernando Romero EnterprisE (FREE), a firm led by Helú’s son-in-law. Wrapped in 16,000 hexagonal aluminum tiles, Museo Soumaya’s shining, serpentine skin was built to reflect the sun’s light and to stand the test of time. The weight of the spiraling form is supported by 28 curved steel vertical columns and is stabilized by seven ring beams. The museum’s flat, anvil-like top is suspended from a cantilever that streams in natural daylight through a large skylight to the top floor—the only significant opening in the windowless museum. Located in a mixed-use development, the museum also houses a library, gift shop, restaurant and 350-seat auditorium. Commissioned by business magnate Carlos Slim Helú, the $800 million structure was inaugurated in early 2011 and offers free admission. Wrapped in 16,000 hexagonal aluminum tiles, Museo Soumaya's shining, serpentine skin was built to reflect the sun's light and to stand the test of time. The museum's flat, anvil-like top is suspended from a cantilever that streams in natural daylight through a large skylight to the top floor—the only significant opening in the windowless museum. 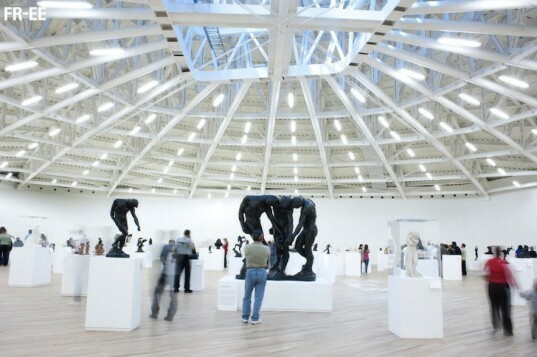 The expansive art museum houses one of the most important art collections in Latin America. The weight of the spiraling form is supported by 28 curved steel vertical columns and is stabilized by seven ring beams. Located in a mixed-use development, the museum also houses a library, gift shop, restaurant and 350-seat auditorium. The $800 billion museum was inaugurated in early 2011 and offers free admission.